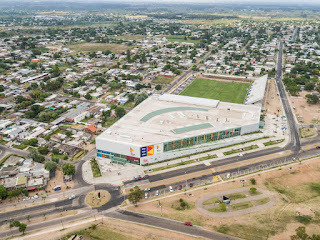 The new logistics hub located in Brandizzo, serves 25 stores and guarantees clients that products are delivered in the shortest possible time, with the lowest CO2 emissions. This warehouse has a gross surface area of roughly 23,000 m2, and is divided into two units; one unit is mainly dedicated to picking while the other one only stocks bulky material. A new layout has been studied here and will be used in all new Decathlon warehouses worldwide. Two automated mezzanine floors have been inserted, allowing the process to be quicker, more sustainable and more profitable. As the building is undergoing a LEED certification, great attention has been paid to sustainability. Green choices have been made both in terms of a passive structure and mechanical plants. 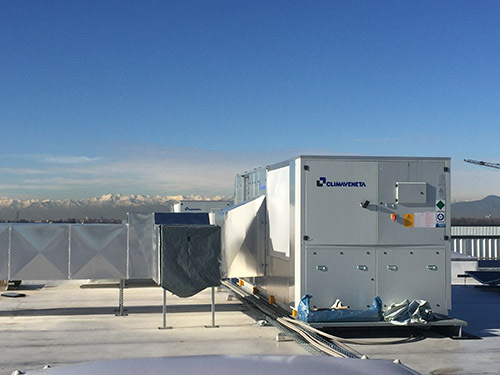 The HVAC system is based on 15 WSM high efficiency reversible air cooled roof top units by Climaveneta. 10 of them are dedicated to the open spaces, 4 to the automated mezzanine floors and the last one to the laboratories, for a total air flow of about 340.000 m3/h. 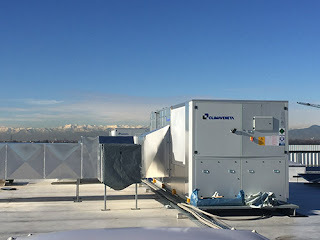 Going into detail, they have installed 7 WSM/CE 402 with free-cooling and 8 WSM/ HR with thermodynamic heat recovery to maximize the energy efficiency under all weather conditions. High COP index, higher than 5, allows not only for respecting the LEED certification prerequisites, but also for the system to outperform the output required by the regional legislation at -7°C and +33°C.